This parking lot on Lee Highway in Fairfax, Virginia, caught my eye one recent Saturday. 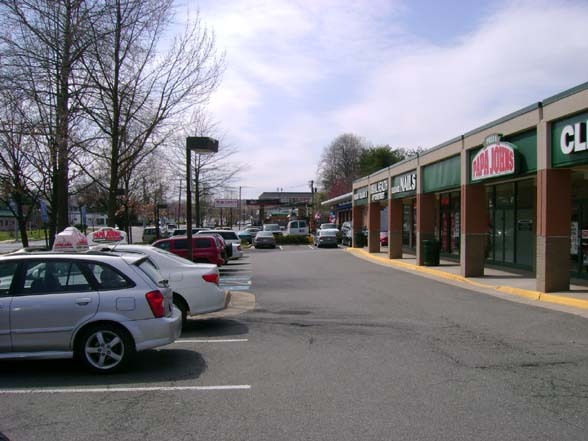 It's at the far corner of a large development called The Shops at Fairfax. At the time, I had two-legged and four-legged passengers on board eager to reach their particular destination, so I didn't slam on the brakes and jump out with my camera. But I did immediately exclaim, "Now THAT is what a parking lot should look like in strip shopping centers!" I finally made it back there a few days ago with camera in hand. No parking lot is accident proof, but as you can see in these photos, this design at least points vehicles away from the storefronts. Arranging the spaces so cars pull in toward a berm planted with bushes—rather than pulling up to windows and doorways—reduces the odds that a driver would injure someone or seriously damage property if he lost control. A driver backing out of one of these spaces could still crash backward into a storefront, of course. And with no bollards or other barriers protecting those stores, the results wouldn't be pretty. 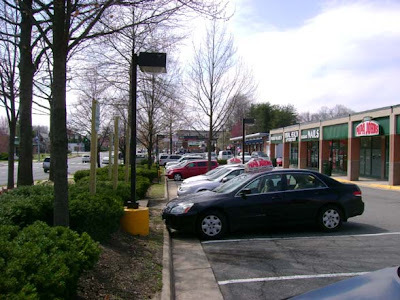 Still, kudos to Bethesda, Maryland-based Saul Centers, Inc., for using a parking design for this little retail strip that at least lowers the odds of a storefront crash.